A Maryland dad who learned his house caught fire with his children inside flipped his car as he raced home and then ran the remaining half-mile, officials say. Carlos Pettigrew said he had one thing in mind as he hurried home: "that I was going to lose my children, and I wasn't ready for that," he told News4. What could have been a tragedy began just before 11 a.m. Wednesday, when Prince George's County fire crews were called to a townhouse in Kettering, Maryland. Pettigrew's three children and their teenage babysitter smelled smoke. The children, ages 7, 9 and 13, and their 15-year-old cousin all got out of the house safe. 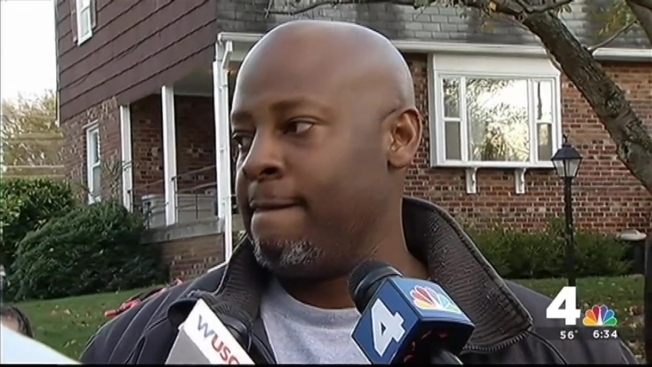 Pettigrew, a teacher at Oxon Hill High School, was informed of the fire by phone and rushed home. Just seconds after he got the call, he rolled his SUV into a ditch at Central Avenue and Enterprise Road. The father of three crawled out of the upside-down car and started running the rest of the way home. He reunited with his children and surveyed the home, which is left blackened and full of debris. Pettigrew was taken to a hospital with minor injuries, according to fire department spokesman Mark Brady. He had been released by Wednesday evening. Wife Connie Pettigrew said it was a miracle everyone was safe.